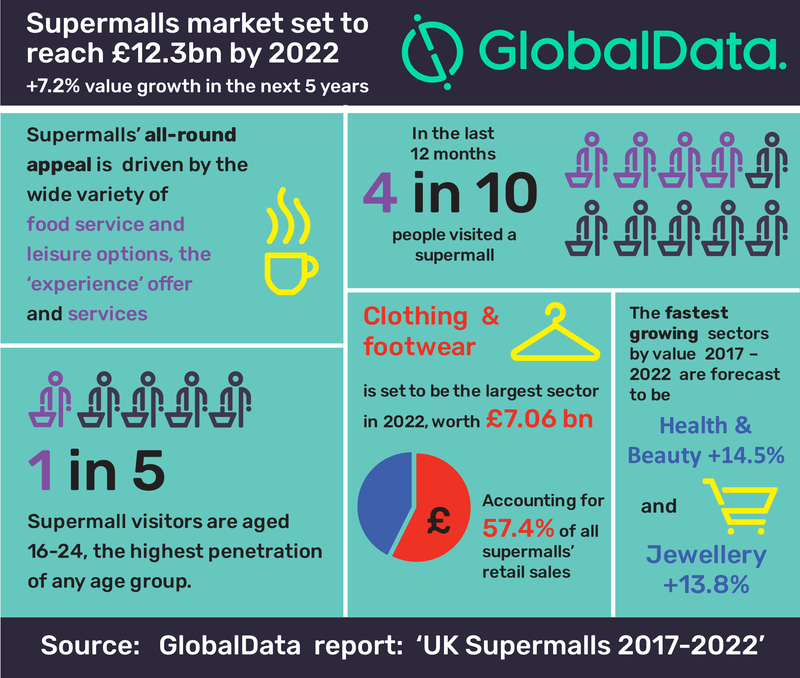 The UK Supermalls market is forecast to rise 7.2% over the next five years, outpacing growth in physical locations, forecast to be 5.0% (across non-food sectors), according to GlobalData, a leading data and analytics company. The company’s latest report: ‘UK Supermalls 2017-2022’ reveals that although clothing & footwear will remain the largest sector and the biggest contributor to growth, smaller sectors within the channel including health & beauty and jewellery are set to be the fastest growing rising by 14.5% and 13.8% respectively. The all-round appeal of supermalls will drive the market to reach £12.3bn in 2022 helped by the wide variety of food service and leisure options together with consumer desire to spend on experiences and services. In the last 12 months 43.2% of the UK population have visited a supermall attracted by the wide choice of retailers and products, alongside the experience that a supermall offers. Fashion retailers such as Primark, H&M and JD Sports have created large format destination stores in supermalls with strengthened product ranges suggesting a new set of key retailers will usurp traditional anchors such as Debenhams, Next and M&S in the coming years. A best in class multichannel experience is vital at supermalls to protect against spend shifting online. A supermall is defined as a large shopping centre that is over 1,000,000 sq ft and usually has annual footfall over 20 million.